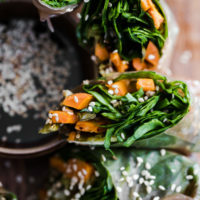 Roasted Sweet Potato Spring Rolls with Spinach | Naturally.Roasted Sweet Potato Spring Rolls with Spinach | Naturally. These sweet potato spring rolls make for a delicious and vibrant lunch that is gluten-free and easily vegan. In a small bowl, combine the chili flakes, garlic, honey, vinegar, and salt. Cut sweet potato into long and thinner sticks (1/4″ thick). Slice the scallions lengthwise into quarters and roughly the same length as the sweet potatoes. Toss sweet potato and onion with the chili mixture. Place on a baking tray and roast for 25-30 minutes- sweet potato should be just beginning to brown. Remove from the oven and let cool slightly before assembly. Roughly chop the spinach and place in a bowl. Set up an assembly station with the slightly cooled sweet potatoes, spinach, sesame seeds, a bowl of warm water, and a cutting board. Soak the rice paper for 10-15 seconds (you don’t want it too soft when taking it out of the water.) Place rice paper on a cutting board and load with spinach and sweet potatoes. Sprinkle with the sesame seeds then roll, tuck, and fold in sides as you go. Continue with remaining ingredients. Once done slice in half and serve with a little bowl of soy sauce. The key with the rice papers is to not overly soak them before laying on the cutting board. They will continue to soften as you stack ingredients.